Railroads provide an inexpensive and convenient mode of transportation for millions of U.S. residents every year. The sheer size of passenger and freight trains and the incredible momentum that they generate are the main reasons that railroad accidents and train wrecks can be so devastating. The lawyers at The Law Offices of Frank L. Branson have experience representing injury victims and railroad employees in courtrooms throughout the country. Mechanical failures, improper equipment maintenance, and conductor negligence are just a few of the reasons that train accidents happen. 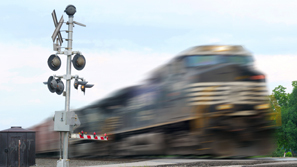 Statistics show that more than 3,000 people suffer railroad injuries in the U.S. every year. That figure includes many victims of railway crossing accidents who failed to see a train approaching or tried to beat a train across the tracks. When a train and a motor vehicle collide, the result is often devastating because of the huge differences in size and speed. The Texas attorneys at The Law Offices of Frank L. Branson have experience representing injured railroad workers under the Federal Employers’ Liability Act (FELA), which allows railroad employees to bring claims in either state or federal court. Our experienced team of lawyers uses a combination of expert investigation skills, effective negotiations, and proven ability in the courtroom to help clients receive the compensation they deserve.